Most fatal accidents involving large trucks are actually caused by other vehicles, usually a car. Too often drivers of smaller vehicles underestimate the size and the speed of semi trailer or other large trucks sharing the road with them. A significant number of car-truck crashes happen at intersections because the driver of the car doesn’t realize how quickly the truck is approaching. Many crashes between a car and a truck also happen on highways the most common causes being car driver cutting off a truck to reach the exit, driver lingering alongside the truck when passing, or motorist following too close or tailgating. Because of the size and weight of the trucks, accidents are very often fatal. Semi-tractor trailer trucks are by far the most dangerous type of large trucks on the road. According to the Large Truck and Bus Crash Facts 2010 study from the U.S. Department of Transportation, Semi trailers were involved in 62.2 % of fatal large truck accidents. 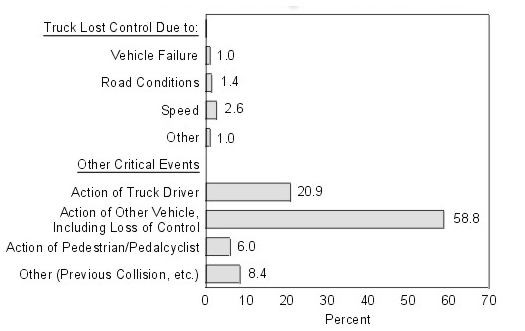 Even though the direct cause of the accident is not the trailer itself, a crash test conducted in March by the Insurance Institute for Highway Safety (IIHS) demonstrated that seven of eight truck trailer manufacturers fell short in preventing head and neck injuries that kill more than 200 car passengers every year after the front of their vehicles struck the back of a trailer. The IIHS believes that improved underride guards would substantially increase the protection of vehicles passenger and save lives.